1. Baranagar Mission Ashrama installed a statue of Sister Nivedita on its campus. Besides, an exhibition on Sister Nivedita was also set up. 2. Chennai Math held a drama on Sister Nivedita and released a DVD containing a hari-katha (religious discourse intermingled with songs) on her. Besides that, in association with a drama troupe, a Tamil drama on Sister Nivedita was also produced. 3. 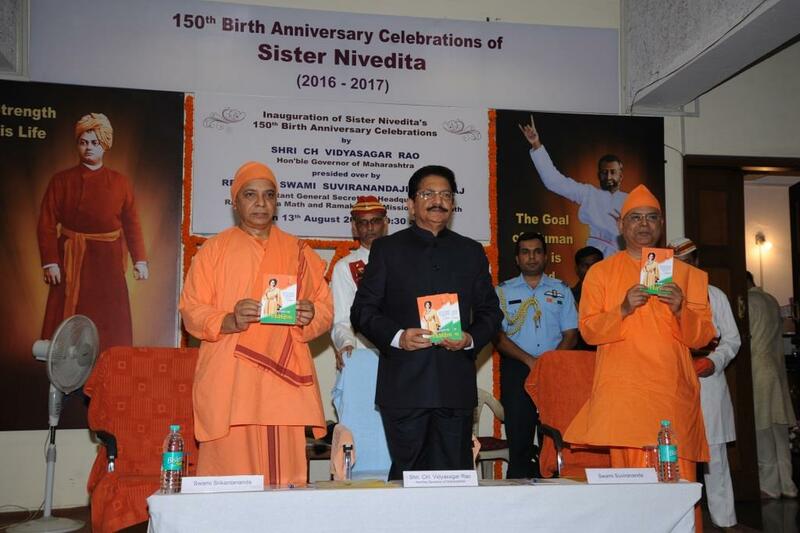 A Tamil book on Sister Nivedita, jointly published by Chennai Vidyapith and Chennai Math, was released. 4. Chennai Vidyapith inaugurated the newly renovated Sister Nivedita Hall. 5. On the initiative of Kankurgachhi Math, a procession was held at Khanakul in Hooghly district. 6. New Delhi centre conducted a symposium on the topic “Nationality: Basis of Interfaith Harmony” in which 22 speakers representing different religions took part. 7. Rahara centre, in association with Indian Council of Historical Research, New Delhi, conducted a national level seminar on ‘Sister Nivedita and her Contribution to India – A Historical Perspective’. 8. Visakhapatnam centre released Bhagini Nivedita, a Bengali film dubbed into Telugu and conducted a written quiz competition on Sister Nivedita in which nearly 87,000 students from 575 schools in Andhra Pradesh and Telangana participated. 9. The following centres held conventions / seminars for youths and students: Advaita Ashrama (Kolkata), Antpur, Bamunmura, Barasat, Barisha, Bhopal, Cossipore, Gourhati, Kadapa, Kankurgachhi, Lucknow, Medinipur, Mysuru, Ponnampet, Port Blair, Pune, Puri Mission, Rajamahendravaram, Rajkot, Ranchi Morabadi, Tamluk, Vadodara and Vijayawada. Total no. of programmes: 44; Total no. of participants: 18,149. 10. The following centres held cultural competitions: Chennai Math, Chennai Vidyapith, Dehradun, Mysuru, Ootacamund, Pune, Puri Mission, Rajamahendravaram, Salem, Sarisha, Shillong, Tamluk and Vijayawada. Total no. of programmes: 14; Total no. of participants: 63,047. 11. The following centres held lectures: Baranagar Math, Bengaluru, Hyderabad, Jalpaiguri, Lucknow, Mangaluru, Ponnampet, Raipur, Ranchi Morabadi, Swamiji’s Ancestral House, Vadodara and Varanasi Home of Service. Total no. of programmes: 60; Total no. of participants: 26,084. 12. The following centres held devotees’ conventions: Baghbazar, Bamunmura, Barisha, Gourhati, Kamarpukur, Kankurgachhi, Karimganj, Malda, Puri Mission, Purulia, Ranchi Morabadi and Swamiji’s Ancestral House. Total no. of programmes: 20; Total no. of participants: 10,978. 1. Dhaka (Bangladesh) centre held a programme comprising special worship, two public meetings and cultural events. 2. Florida (USA) centre held lectures and cultural programmes, and screened a film on Sister Nivedita. 3. Malaysia centre held special lectures, cultural programmes and a film show. 4. Singapore centre conducted a devotional music programme and a spiritual retreat.